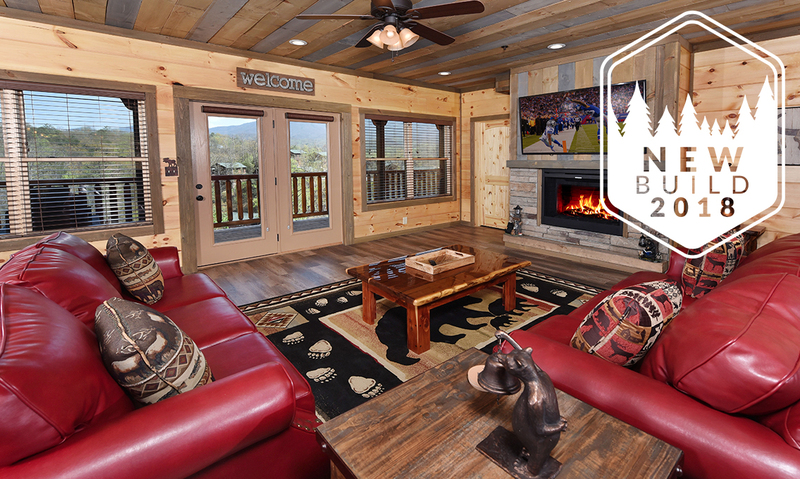 Inside, enjoy Smoky Mountain décor, a roomy interior, and your favorite cabin amenities, including an indoor garden tub, game tables, and a private theater. Outside, prepare your guests for amazing views of the Smokies from 3 levels of covered porch space, where you’ll find rocking chairs, patio furniture, and 2 outdoor hot tubs with their own outdoor TVs. 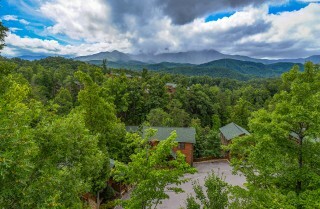 If that weren’t enough, Cherokee Dreams Lodge offers you access to community amenities like an outdoor pool and walking trails as part of the Gatlinburg Falls Hidden Valley Resort. 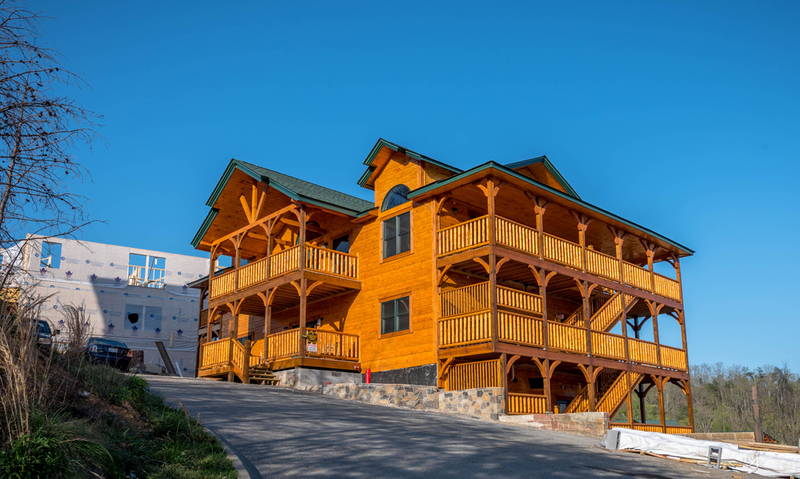 If you want a large group cabin that provides plenty of space, memorable views, a variety of entertaining options, and a premier location, Cherokee Dreams Lodge —less than 3 miles from downtown—is the right choice for you! And if you're planning a larger group getaway, consider booking multiple neighboring cabins for privacy and proximity. 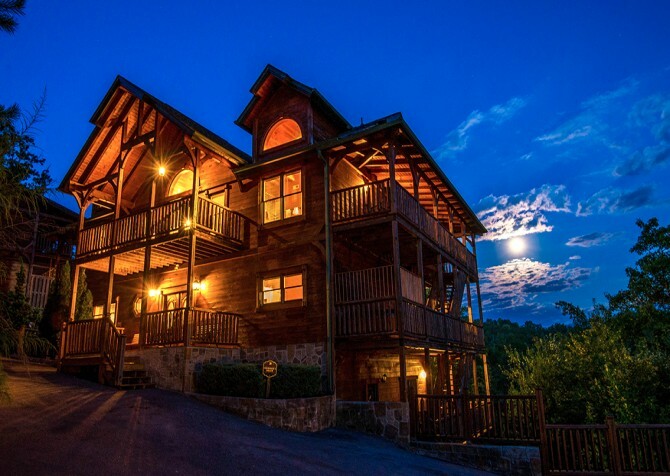 The gorgeous Cherokee Dreams Lodge is within 500 feet of 3 other great cabins: Views Above the Rest, Unforgettable Views & A Theater, and Splash 'N Views (next door) if you need more space for a wedding, special occasion, or big family reunion. Every large group getaway needs a cozy place where the group can gather together, and Cherokee Dreams Lodge provides that with its spacious, warmly decorated living room with nice, soothing fireplace. Adjacent to the living room you’ll find a full-size sofa and plenty of floor space for pulling up chairs from the dining room. This way, you’ll be able to fit the entire group together for a gift exchange, bridal party game, company presentation, or anything else you might have planned for your Gatlinburg stay. At the center of the living room, you’ll find a large coffee table, which is perfect for displaying snacks or even a Cabins for YOU gift basket—a perfect complement to any Smoky Mountain vacation. 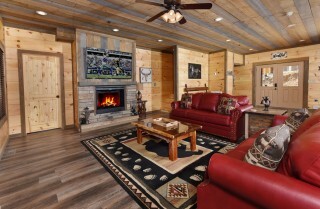 Finally, this room provides an electric (no heat) fireplace and, directly above that, a big screen TV with cable. 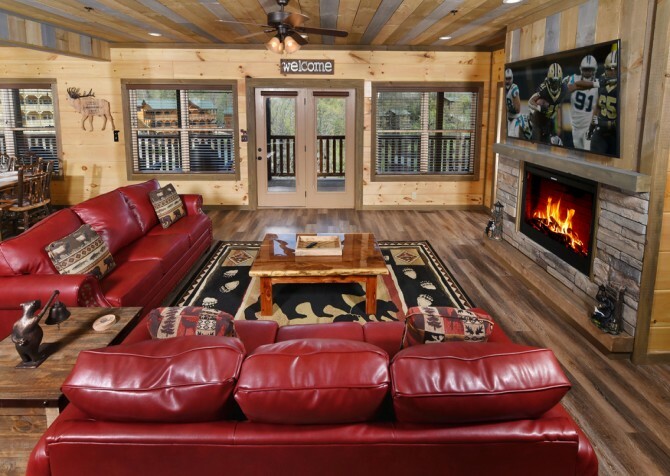 Watch a favorite show, relax in front of the fire, and enjoy your time together inside Cherokee Dreams Lodge! Maybe you’re not worried about entertaining 30 people as much as you are feeding them. Well, at Cherokee Dreams Lodge, you don’t have to worry about either one! The full-size kitchen inside this 5,300-square-foot cabin comes with double of almost everything. 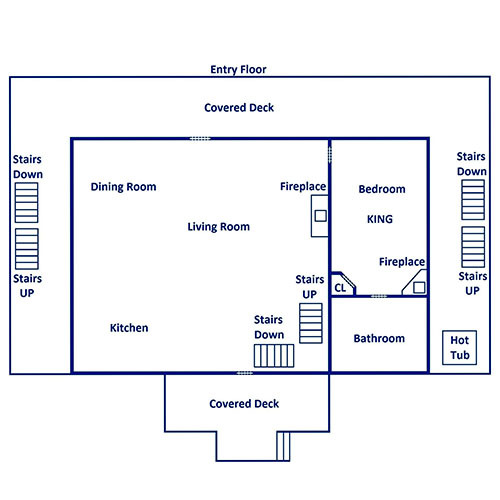 You’ll have 2 refrigerators, 2 ovens, 2 dishwashers, and 2 microwave ovens. 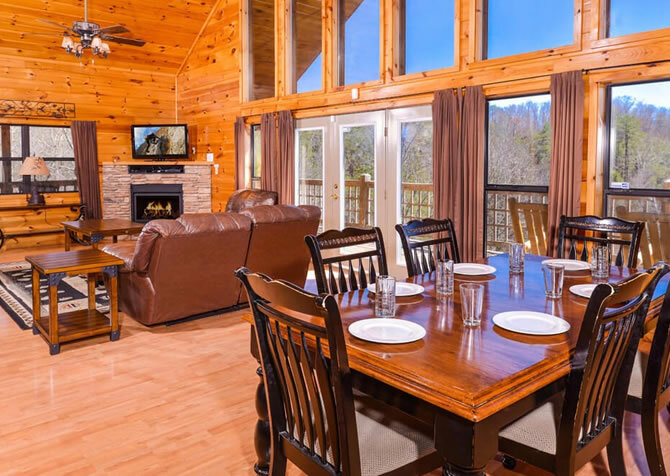 Use these appliances, plus your ample counter space, for preparing group meals that will save everyone from navigating traffic in Gatlinburg and spending a lot of extra cash. Another easy way to feed a group, especially for special events like a rehearsal dinner or celebratory meal, is to look for downtown restaurants that offer large-group catering services. The full-service kitchen will allow your caterers to take care of the group so everyone can relax and enjoy the occasion! So you plan a large group meal—perhaps a breakfast casserole in the morning or a large pot of chili on a cool, Smoky Mountain evening—are you wondering where all 30 of your guests are supposed to sit? 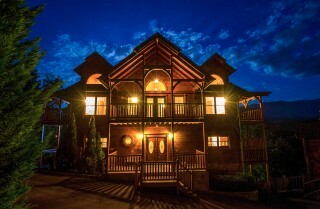 At Cherokee Dreams Lodge, we’ve got you covered! You'll have large hickory dining tables with seating for 20, plus 7 hickory bar stools for even more space. And with a nearby, open-concept living room and outdoor deck furniture, there are plenty of ways to sit down for group meals! So go ahead—plan for an enjoyable evening in as you eat around the table at Cherokee Dreams Lodge! Two of the largest spaces in the cabin, the 2 game rooms of Cherokee Dreams Lodge provide various options for indoor play, whether you’re trying to stay out of the heat or pass the time on a rainy day. 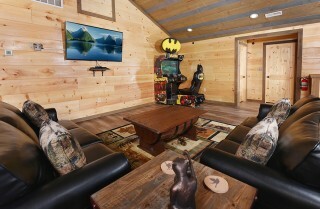 Features of this room include an air hockey table, rustic-look pool table, a 65-inch TV with an HD Blu-ray player, and a 60-game video arcade game! 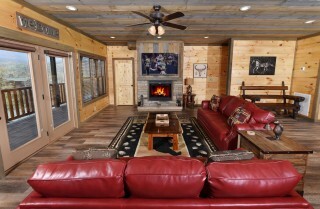 The downstairs game room features a “barn-style theater room,” where you’ll have seating for 17 and access to a 75-inch HD smart theater TV and Blu-ray/DVD player – so don’t forget to pack your favorite flicks! Whatever says fun to you, you can make it happen inside Cherokee Dream’s Lodge! 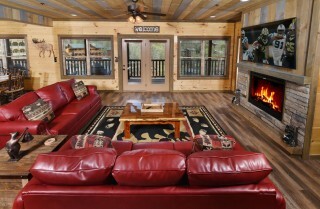 Cherokee Dreams Lodge is sure to be your dream cabin when it comes to sleeping spaces. 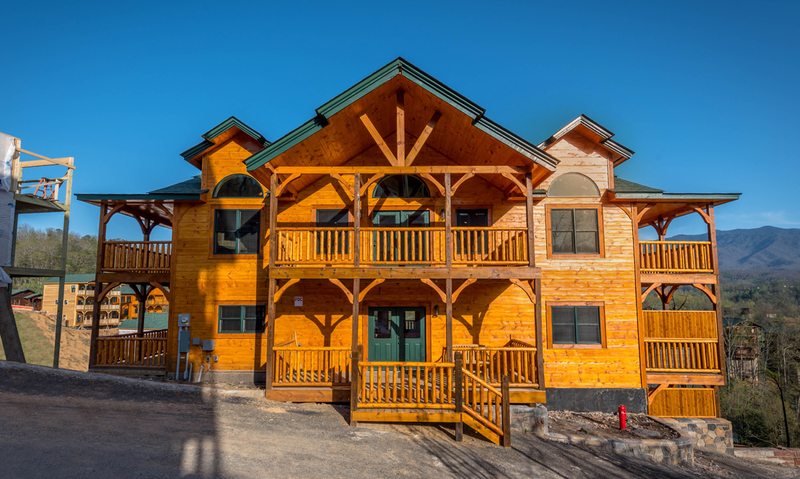 This large group cabin features 7 bedrooms and 7 bathrooms, providing ample space for up to 30 guests. 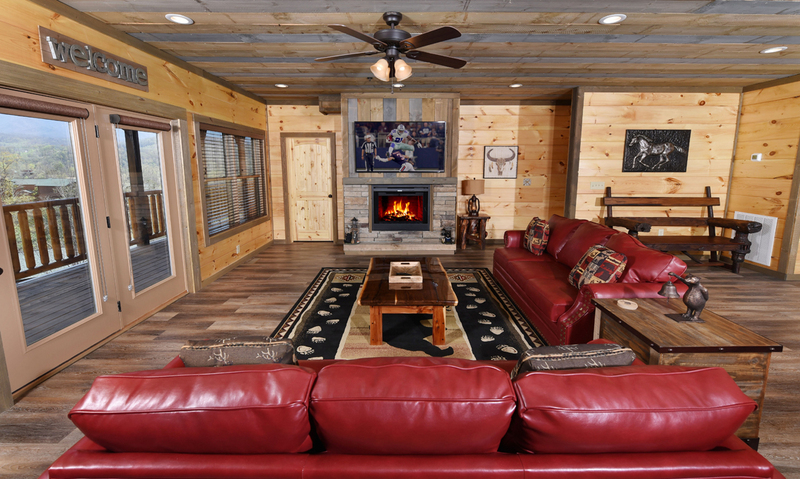 While each of the 7 bedrooms has its own unique design and flair, we can tell you this about all of them: they have their own electric (no heat) fireplaces, they have their own 50-inch smart TVs, and they have plenty of space! 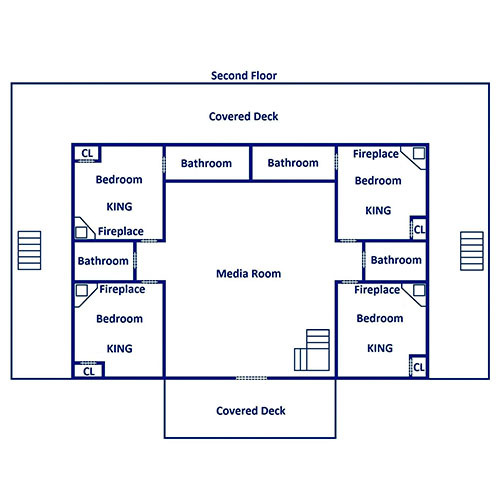 Five of the bedrooms feature king-size beds, with a master suite on the entry-level floor and 4 king suites upstairs. 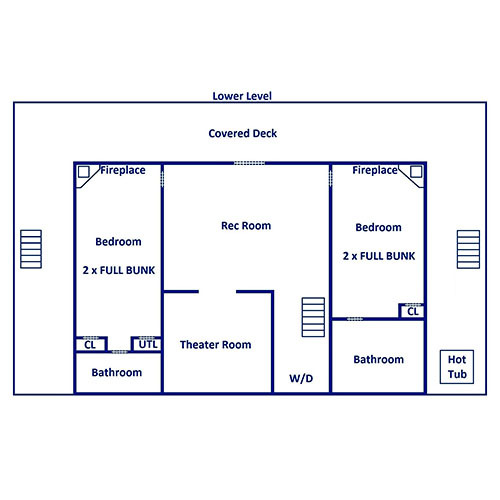 Downstairs, 2 large bunk rooms feature full bunks. Plus, there is a sleeper sofa in the living room and another queen sleeper sofa in the rec room upstairs! 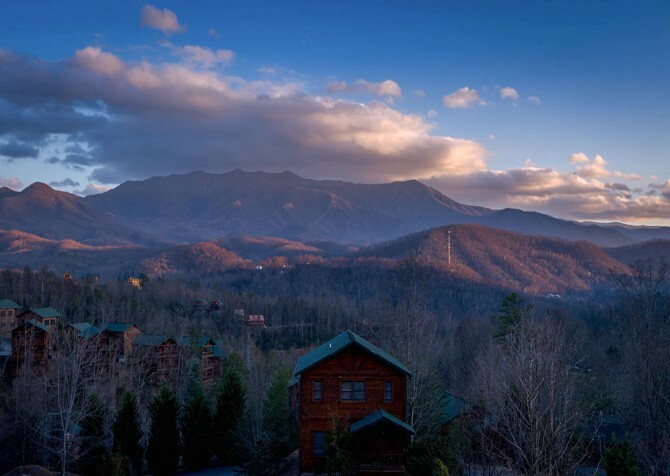 When you take the time to travel to the Smokies, we want to make sure you experience the true grandeur of these mountains. 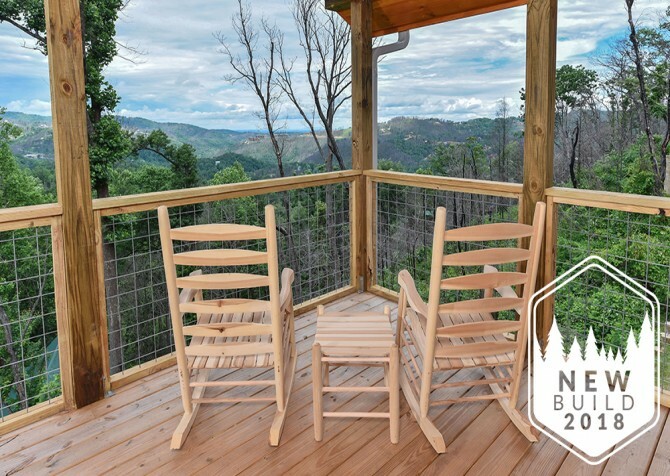 That’s why cabins like Cherokee Dreams Lodge — built high on the mountainside to offer sweeping views of the Smokies — offer multiple levels of deck and plenty of options for outdoor seating. 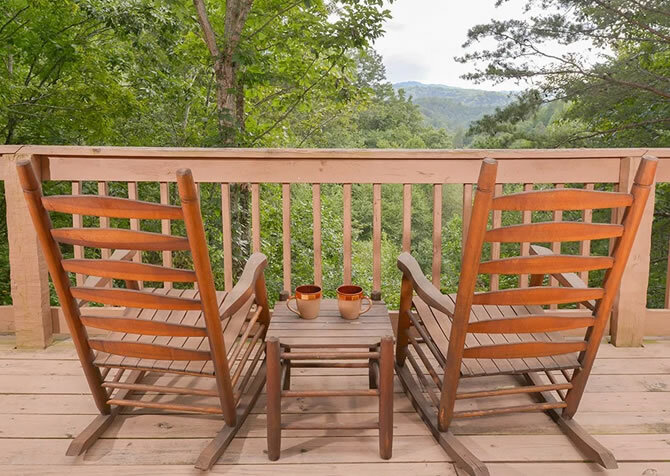 This cabin in particular offers rocking chairs and multiple sets of patio furniture. 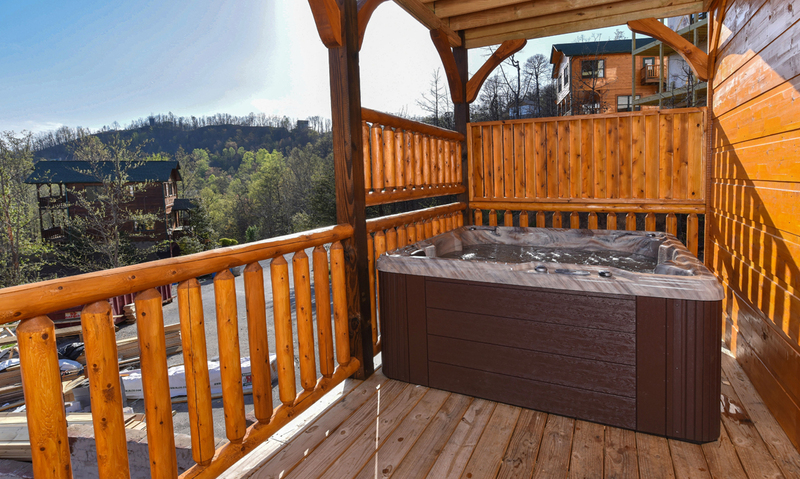 Even when the sun goes down, you can still enjoy these outdoor spaces with their multiple outdoor hot tubs (2) and outdoor TVs (2). To top it off, Cherokee Dreams Lodge offers the little things like a charcoal picnic-style grill. So you can prepare your outdoor favorites while soaking in sights you simply won’t find in any downtown hotel! Nestled within the perimeters of the Gatlinburg Falls Hidden Valley Resort, Cherokee Dreams Lodge offers so much more than what you’ll find inside the cabin. Community amenities offered by Gatlinburg Falls include an outdoor pool, pavilions, and walking trails. 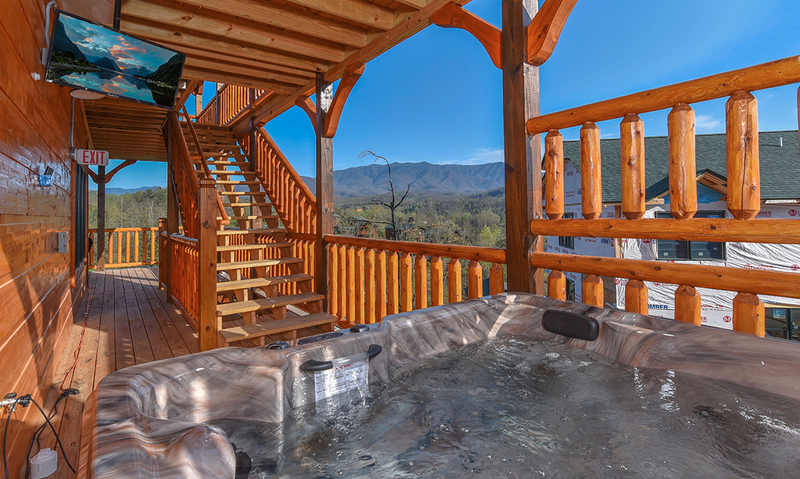 Feel free to use any of these amenities that you need during your Gatlinburg stay at Cherokee Dreams Lodge! 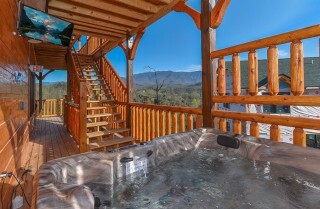 You’ll also enjoy access to an indoor garden tub, washer/dryer set, and high-speed wireless internet. We hope you’ll take advantage of all this large group cabin has to offer, including free access to our Cabins for YOU blog, where we’ll keep you up to date on Gatlinburg events and attractions you don’t want to miss while you’re in town! 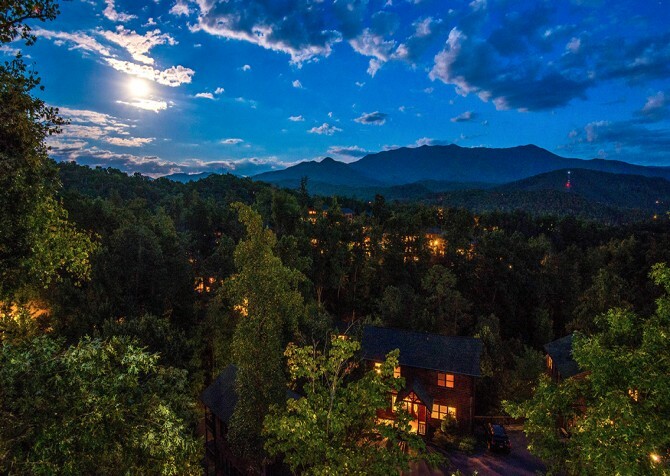 Designed by 3-time Masters and British Open Championship winner Gary Player, Bent Creek is a par 72 course with meandering mountain streams and breathtaking views of the Great Smoky Mountains National Park. For those looking for a golf experience that’s a little less … serious, try the Ripley’s Mini Golf Course instead. This fun, themed Davy Crockett course with 36 holes of Smoky Mountain fun is a great choice for kids and families. If your group wants a little variety when it comes to having fun, head on over to Ober Gatlinburg, where you’ll find everything from a mountain coaster to ice skating to water raft rides—and much, much more! *CFY partners offer discounts to our guests. Ask our reservation specialists for more information about discounts offered at these and other local attractions. "We had a great time and the accommodations were perfect for our family. Plenty of space and comfortable beds." 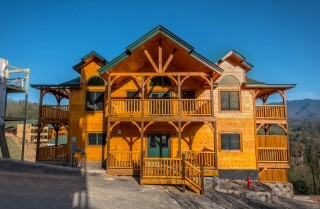 "We stayed in Cherokee's Dream Lodge - sleeps 30+. Great experience there. Beds were comfy and clean. Adequate and great quality towels. Kitchen stocked with everything needed to make great meals (cookware, utensils, pots, double appliances etc). Cabin was clean and orderly when we arrived. Only issue is parking is limited. Wish they had a lot somewhere we could park. A lot of people carpooled so it worked out for us but It was getting tight. But would definitely stay here again."